Are you one of them who are suffering from the pain of being bald? Feeling so embarrassed when you go out with your friend or family? Using a wig may give you a temporary solution to cover your baldness. But your friends may still make fun of you. There are various ways to recover from the baldness and various techniques are also available but you need to select the one after undergoing a free consultation with our experienced hair transplant surgeon who can help you out with your questions, and will also gives you with ways to recover from baldness and get natural growing hairs. 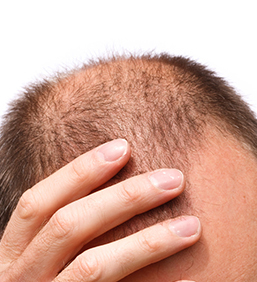 It has been estimated that around 50 million men in United States are suffering from baldness problem. The root of the same start from the hair loss and hair thinning and as times goes it result into hair baldness, in which some time it claims the hair from side, front or rear of your head. Follicular Unit Extraction (FUT) or Follicular Transfer: This is cost effective technique having different benefits which makes it first choice for many in UK to opt for this technique. Benefits like minimal invasive, walk in walk out procedure, no night stay, and most importantly cost effective, local anaesthesia are used etc. In this technique follicles are extracted from donor area, mostly from back side of head or ear and then they are applying to the area which is affected due to baldness. Depending on the number of follicles required to stick on the bald area the procedure may take 2 to 9 hours and person can start their daily routine from very next day. FUE (Follicular Unit Extraction Body Hair): If the surgeon could not find the hair from your backside then in those case advance technique of Follicular Unit Extraction is applied where the body hair are used for the transplantation. Generally body hairs grow only 4 cm but it has been tested and verified that when those body hair are applied on the area affected from baldness after that the hair may grow up to 15 cm. This is also known as risk free technique. Mesotherapy: In such technique, small or tiny injections are applied to the middle of skin called mesoderm from which the techniques get its name. This injection will contain the formulas or drugs which will balance the hormonal changes, provide necessary nutrients and lastly provide good blood circulation which is needed for proper hair growth. However, this procedure may require 10 – 12 sessions to be undergone so the time it will take to recover from baldness could be more. PRP (Platelet Rich Plasma Technique) – Under this technique, our own blood is taken out from which the experts will extract the plasma which are rich in regenerating tissues that can help in growing hair again. In this technique tissues of scalp which has dies out after injecting the plasma will start regenerating, which will in turn grow the hair. 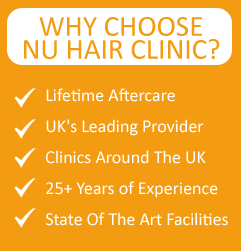 Connect with Nu hair clinic in UK, in case you need ways to recover baldness, we have various surgical and non surgical procedures which could help you as an affordable and effective way of recover baldness naturally and start growing hair without any further loss of hair. Every surgery may result into minor risk and complication but at clinics in UK we also have other ways of recover baldness like with non surgery and treatments which will be less risky. Register for free consultation and our team will provide you with information about all risk and complication involved before going for any surgeries. This entry was posted on Wednesday, February 10th, 2016 at 1:04 PM	and is filed under Hair Loss Treatment, Hair Transplant. You can follow any responses to this entry through the RSS 2.0 feed. Responses are currently closed, but you can trackback from your own site.